In the last four years Australian audiences have started to embrace audio streaming, but many advertisers are still struggling to adjust to the new world order for audio. Alex Hayes looks at some of the key points from the recent Spotify and Pandora Unrivalled events and how advertisers and agencies are embracing the platforms. In 2012 two media players with global footprints but relatively little exposure in Australia hung out their shingle in the local market, audio streaming services Pandora and Spotify. Over the next four years they would see several local and international competitors rise and fall. And while the reporting on audio streaming in Australia focussed on the troubles of Guvera, the folding of Mog into Apple Music or the demise of Deezer, very little of it actually looked at the impact the rise of the sharing economy was having on the audio landscape, as consumers shifted habits. And where consumers go, advertisers follow. “Audio streaming is where online video was two years ago,” says Ikon Brisbane’s digital director Eve McCormack. The fact radio is starting to feel an impact from Spotify and Pandora in the local market is perhaps best summed up by Commercial Radio Australia’s recent campaign centred around the share of voice these streaming services should be “entitled” to in an ad based on a consumer study of listening habits. CEO of the Interactive Advertising Bureau Vijay Solanki says upcoming research from the digital industry body shows “50% of all media buyers are including streaming as part of their mix, so it seems at least half are looking proactively at streaming”. While the data shows streaming is still only reaching around a third of Australians – although Solanki says the IAB’s Nielsen online data shows approaches half of the population in some months – Spotify and Pandora would point to the makeup of that audience as many of the people advertisers are finding it much harder to reach. Spotify’s national sales director Andrea Ingham says recent research by them which concluded people using the free streaming tier were “more likely to buy across every category apart from pain relief”. Pandora’s Chris Freel also points to the fastest growing demographic in the sector being the 25-49 year olds who he says are catching onto the trend. The audience rationale given by Holden’s senior manager of media and brand partnerships Paul Balbo when he was asked about the carmaker’s early embracing of streaming. “The audience scale and engagement were attractive to us,” says Balbo. McCormack describes two different ways Ikon Brisbane is looking at the audio streaming space to help improve reach. “Fundamentally there’s two ways to come at it,” she says. “Generally if it’s a broad-reaching campaign across the demos traditional radio still is a cost-effective way of reaching a broad audience. And so in that space music streaming will come in as an incremental reach play. “Bear in mind there’s also a whole lot of people who we can no longer reach through traditional TV, newspapers and radio, so audio streaming adds audience there. Balbo agrees, saying Holden has worked with its media agency Carat to shift away from having a traditional radio budget to an audio strategy. “From a budget point of view it initially came from digital in a test, trial and learn phase, then it came from radio, and now we’re in a place where we look at audio in totality on what it means for 2017,” he says. Balbo admits the company has more than a passing interest in the rise of personalised audio given the investment the company has made in connected car technology. Both Pandora and Spotify even feature in recent ad campaigns, including one talking about how women feel “misunderstood” by the car industry. Indeed the carmaker even had a very shortlived outdoor campaign with the tagline “Goodbye breakfast radio, hello Spotify”, and another with Pandora, which Balbo admitted they had to pull down after just a few hours. Balbo says its journey with streaming has recalibrated the way Holden looks at and executes its audio creative. “We see three or four times the results when we see creative that’s right for the platform and tailored,” he says, comparing it to when they just run radio ads. Measuring success is also something clients and agencies have had to work hard on, given the unique nature of streaming platforms. One sticking point is how they compare, apples for apples, radio and streaming. McCormack says the platforms have highlighted the need for marketers to give up on the “vanity metrics” around many digital channels, as they do not apply in that environment. “Often it’s about cost effective reach and digital engagement and not so much the last touch attribution model,” she says. The IAB’s Solanki points to the data held by the streaming services as the thing that will help move the industry forward. The former Southern Cross Austereo head of innovation says: “Having worked in radio the shift that streaming provides is having data on behaviour rather than claimed and that shift is going to be more and more important for marketers and their agencies. He points to the inclusion of mobile data to the Nielsen survey which showed how much audio streaming was growing. “In terms of measurement the data that comes from the streaming organisations is vital, and the ability to move beyond the traditions of daypart and look at what people are doing and the mood you offer is becoming an important part of measurement. 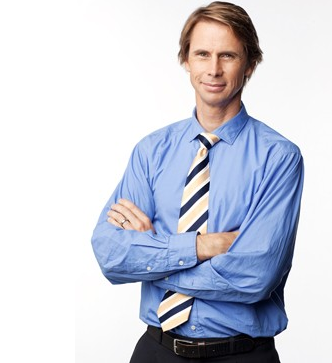 Pandora’s Freel says both they and Spotify are keen to have a unified measurement system in Australia. “To be able to measure that by station and territory. That’s where we’d like to get to, it takes time for a number of different reasons,” he says. Audio streaming platforms and artists haven’t always had the easiest relationships, with well-reported issues from both sides regarding revenue models and returns for the industry. Ina video recorded for the Unrivalled event Tim Levinson, who performs as Urthboy and manages other acts including Hermitude, spoke about the evolution of that relationship with artists and the platforms, and the new ways of working it has created. How will personal audio look in the future? One major difference between radio and streaming is the lack of presenters on the latter. For some people that’s obviously a plus, and for others a minus. According to futurist Ross Dawson that is something we will see addressed in the next iteration of audio, with streaming apps being combined with other services in the not so distant future on connected devices and cars. “If we imagine what we have thought of in the past as radio might become tomorrow, for example in car,” he says. “Now people could say I don’t want to listen to music from a particular radio station, I want to listen to my own music, but I want to listen to the news, and the news from my particular slant or perspective. I also want the traffic updates on the route that I’m driving and I want to hear some commentary from my favourite radio host about what’s happening in my city at the moment. “To be able to slice those up into one stream is the future, and platforms like Pandora and Spotify are able to do that. Regular news bulletins, another reason keeping people welded to radio stations, is something already being tackled by News.com.au in a marketing campaign. It entails recording 30-second bulletins and sending them over to be broadcast in ad slots on the free tier of both Pandora and Spotify. Asked about the campaign Julian Delany, managing director of News.com.au, says he hoped to take it from being a paid service to something they collaborate on with Pandora and Spotify to add value to users. “Our internal goal at News.com.au is to be the source of news, not just a site,” he explains. “If we want to be a source of news a great way for us to do that is to create a news bulletins in an audio way. “We’ve been recording news bulletins as you’d expect from a radio station, which is not that hard these days. Delany says he was talking with Pandora and Spotify about making the news bulletins a regular feature of the free-tier of the sites. Pandora’s Freel talks about “accountability” citing “the power of the logged in user” as a main difference. “We’ve got postcode, age and gender information about every single person who’s listening, and we have the ability to target across the day,” he says. He also mentions “ad density” pointing the the maximum of four minutes per hour of ads played on the platforms which means “you are pretty much always first or last in break”. Ingham talks about the ability to map behaviour based on playlists people are listening to, “which allows a message to be contextually relevant”. “There is also the visual aspect, we have display advertising. There’s a lot of discussion in the market around viewability, and both our platforms have best in market viewability,” she says. She also quotes her former colleague at Southern Cross Austereo Clive Dickens who coined the phrase “you can’t close your ears” to describe how much cut through audio on headphones, which is around 80% for audio streaming, has. Ingham admits the audio streaming space, like so much of the digital market, is changing rapidly, which can make it hard to keep up with. While Spotify launched its own programmatic offering this year, trialling it in Australia first, Freel says Pandora is “running to catch up” and expects to launch its own offering in 2017. Both platforms are also working on products to rival each other, with Spotify building out its own discovery capability to mirror Pandora’s Genome, while Pandora is launching a premium on demand offering similar to Spotify. Both have pledged marketing pushes to help grow their audiences, with Pandora looking at the live events space as a lucrative market, helping match artists to their fan bases across the country using its data. 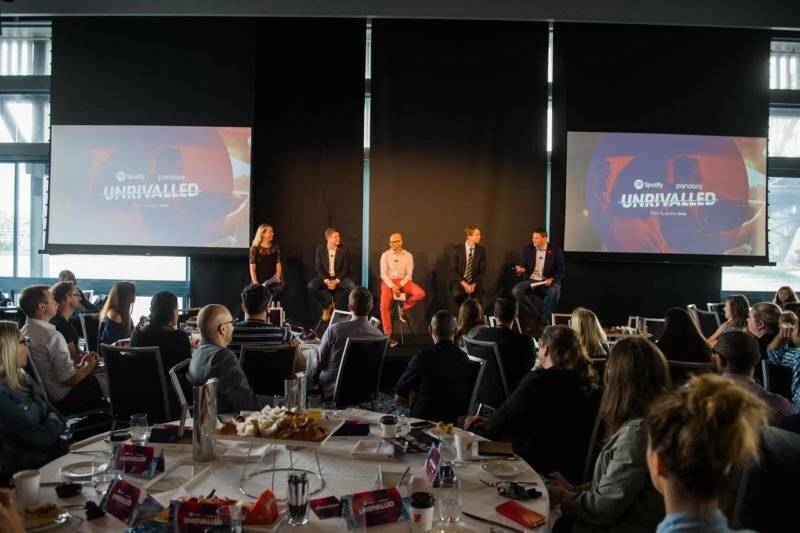 People quoted in this article were speaking at the Unrivalled events hosted by Pandora and Spotify across Melbourne, Sydney and Brisbane in November.